Multi-room audio: everything you need to know | What Hi-Fi? In a short space of time, multi-room audio has gone from an expensive fantasy to an affordable reality for pretty much everyone. You no longer need to trail wires or install complex control systems to be able to send your favourite tunes all around your home, controlled by the touch of a button or even just the sound of your voice. And there are more wireless speakers at your disposal than ever, from multi-room specialists such as Bluesound and Sonos, to hi-fi brands like Arcam, Bang & Olufsen and Audio Pro, and tech giants such as Amazon, Apple and Google. 20 years ago a home multi-room system would have meant a lot of wires (albeit nicely hidden, no doubt) and a fair chunk of cash. High-end custom installers can still offer a top-notch no-stress system, but a more simple, wireless solution is now within the reach of all of us. Whether you want to start a new music system from scratch or upgrade an existing hi-fi set-up, multi-room means adding one or more (more than one, really...) wireless speakers or wireless devices to your home. These then communicate with each other and can be controlled via an app on your phone, tablet or computer. And now even by your voice. You can then create different rooms of music and either play the same track in unison, or play different music in different rooms. You can stream music from services such as Apple Music, Spotify and Tidal (provided you have subscriptions to each), play your own music from a network-attached storage device (NAS) or computer, or stream music straight from your phone. Brands such as Sonos, Pure and Yamaha were some of the first on the multi-room scene, but have since been joined by - well, everyone, with systems from brands as ubiquitous as Bose, Denon, LG, Panasonic, Samsung and Sony, and most recently, the emergence of tech kingpins Amazon, Apple and Google. It's worth remembering most multi-room speakers can now function as standalone wireless speakers, so you don't have to buy more than one speaker to get started. But it's not really multi-room until you do, though, is it? Multi-room ranges now include wireless speakers, smart speakers, soundbars, AV receivers, stereo amplifiers and network streamers. There are also components that can connect an existing hi-fi system to a multi-room system, such as the Sonos Connect. Brands such as Denon, Sony and Yamaha also bring their AV electronics into play, giving their home cinema amplifiers multi-room smarts so they too can join in on the audio streaming action. How do multi-room systems work? There are two main ways multi-room systems work: by creating their own mesh network or by using your wi-fi. Sonos, one of the early pioneers of more affordable, consumer-friendly multi-room systems, forms its own mesh network. This means having initially connected to your home internet, the speakers form their own internal network. This way, you're not using your home wi-fi when you're streaming music and that tends to make the system more robust. Most other multi-room systems connect and communicate using your home’s wi-fi network. This means they are reliant on the strength and stability of your network and will have an impact on your network bandwidth. In each case, you’ll need to download the dedicated app used by each brand to connect and control your system. All the brands mentioned here have their own app that you use to control your music across your multi-room system. Sonos has its excellent Sonos Controller, Bluesound has its BluOs Controller app, Denon its HEOS app, Yamaha uses MusicCast, B&O uses BeoLink, and so on. In the majority of multi-room cases, you’re tied into a single brand’s ecosystem – brands want you to buy into their systems, after all – so you can’t mix a Sonos speaker with a Bluesound speaker, for instance, to create your multi-room system. But you don’t have to stick to a single brand if you don’t want to. Want to mix and match your multi-room system? The options are to either go through the DTS Play-Fi app, or stream via Apple AirPlay 2 or Google's Chromecast built-in streaming options. Bear in mind that there are two subtle distinctions of multi-room: ones where you can stream multiple sources to multiple devices and rooms (such as Sonos or DTS Play-Fi), or single sources to multiple devices and rooms (AirPlay 2 and Chromecast). Instead of creating their own app and multi-room ecosystem, brands can simply sign up to use DTS Play-Fi’s app. DTS Play-Fi is an app that lets you stream music across selected products from manufacturers such as Arcam, McIntosh, Klipsch, Onkyo, Pioneer, Martin Logan, Polk and Rotel. You can stream hi-res music using the app, and mix and match brands to your heart’s content – although DTS recommends a maximum of 32 connected devices before the performance starts to suffer. AirPlay 2 is the long-awaited update to Apple’s proprietary streaming protocol, one that will allow you to stream music from your iOS device (iPhone or iPad) to more than one product. There’s no separate app to download – the iPhone or iPad itself will be the controller and you’ll be able to stream music over your home's network. Along with Apple’s HomePod smart speaker carrying the feature, Sonos, Naim, Libratone, B&W, B&O, and Dynaudio are just a handful of the audio brands that have confirmed AirPlay 2 support in selected products, meaning you should be able to connect different brands' products together to play music. Google’s Chromecast is yet another way you can stream music across multiple products from various manufacturers, thanks to a huge range of products supporting it – from big-brand TVs and soundbars to wireless speakers and Google’s own Home smart speakers. You can also bring in your old hi-fi products into the mix using the £30 Chromecast Audio dongle, which supports hi-res music. Its biggest strength over AirPlay 2 is that it’s open to all OS platforms, whereas AirPlay only works with Apple devices as the source. You can also link up Amazon’s Echo family of smart speakers - including the first-generation Echo, new Echo 2, Echo Plus and upcoming Echo Link Amp - to create a multi-room set up through its Alexa app. It doesn't support hi-res audio, but supports multi-room via Amazon Music and Spotify streaming. Plenty of multi-room-enabled wireless speakers of course still come with the basic support for Bluetooth, AirPlay or Chromecast that lets you send audio directly from your device to a speaker. This allows you to send audio to your system from YouTube, web browsers, downloaded tracks, videos and more – just like a normal wireless speaker. A new feature since 2017 has been the addition of voice assistants into the wireless speaker world. Amazon Alexa and Google Assistant are both now available on various multi-room speakers and systems, with a whole host of brands partnering with one or other of the voice systems. Apple's Siri is integrated into its HomePod speaker only, but you can still access Siri on products that support AirPlay 2 - you'll just be speaking to your iPhone instead of the speaker. The Sonos One speaker and Beam soundbar go one step further by offering both Alexa and Siri (thanks to AirPlay 2) and the multi-room giant is planning to integrate Google Assistant, too. Once you connect the Beam or One to other supported Sonos/AirPlay 2 products in your home, you can control your entire multi-room system using voice commands. It also means you can access the various tasks that those specific voice assitants are best at doing – for instance, ask Siri to select your favourite Apple Music tune while asking Alexa to set mood lighting on your Philips Hue smart bulbs - from one speaker. An alternative (and cheaper) way of getting voice control is to simply plug in the puck-sized Amazon Echo Dot or Google Home Mini (both under £50), or the upcoming Amazon Echo Input (£35) into your existing hi-fi, AV or multi-room system. What about multi-room audio quality? Naturally, we think audio quality should be near the top of your list of considerations. Most multi-room systems - such as Sonos and Audio Pro - support music up to CD quality (16bit/44.1kHz), but there are also systems (such as Bluesound, Denon, Yamaha and Harman Kardon) that support high-resolution audio streaming up to 24-bit/192kHz. Google's Chromecast Audio also supports hi-res audio up to 24-bit/96kHz. We wouldn’t automatically equate hi-res support with the best sound quality, though, as these kinds of systems tend to lack the transparency to make the most of good quality hi-res recordings. Multi-room systems are as much about how easy they are to use and live with, and the features they support, as their audio performance. It’s why Sonos continues to offer the best overall multi-room experience. It has the slickest app, the widest range of integrated services, and is the best system to live with. It sounds good, too. And it’s remained relevant and fresh over the years by constantly streamlining its multi-room features. Audio Pro's system comes a close second, offering the best sound-per-pound performance we've encountered in a long while in a multi-room system. When it comes to the sound quality of the individual products, it's simply a case of comparing on a case-by-case basis in the same way you would stereo speakers or streamers. As always, you can, of course, rely on our expert reviews. It't the most advanced system around and its control app needs work, but no multi-room system makes better sound-per-pound sense than the Audio Pro. The key to their performance is musicality unrivalled by anything at a similar price - or even quite a lot more. Multi-room speakers include Addon C3, Addon C5 and Addon C10. It’s facing more competition than ever, but no multi-room offering is as complete or as pleasurable to live with as Sonos. 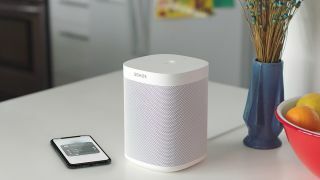 With incomparable support for streaming services, voice assistants and a wide range of connected products, Sonos continues to dominate this sector of the tech market. Multi-room products include: Sonos One, Sonos Beam, Play:1, Play:3, Play:5, Playbase, Playbar, and Sonos Sub. It’s no longer the default choice for those looking for multi-room with superior sound, but the Bluesound route (now in its third iteration) still has much to recommend it, especially if you want hi-res audio support. Bluesound's current line-up includes Pulse 2i, Pulse Flex 2i, Node 2i, Powernode 2i and Pulse Soundbar 2i, and you can add older Bluesound models into the mix, too.